MMS JUNE 2018 108 mmsonline.com machining possible. One article gushes that programs might require "huge amounts of data—10 megabytes is not uncommon," and that "an Ethernet network might be required to download programs of this size efficiently." CAM systems were beginning to offer tool paths designed to avoid sharp directional changes and maintain a constant cutter load. More funda- mentally, higher-than-ever block-processing speeds ("less than a millisecond" in some cases) were enabling CNCs to anticipate motion and adjust acceleration, deceleration and other parameters accordingly. Successful high-speed machining required mechanical elements to evolve as well. "Virtually every aspect of the servo-control system has been upgraded," Mr. Beard wrote in an article covering how machine design was changing. Linear motors and guides were just beginning to be considered for machine tools. Spindles driving tools faster than 10,000 rotations per minute required non-greased bearings to prevent problems with heat, so oil-lubricated bearings with ceramic rolling elements and steel inner and outer races were the order of the day. An article devoted specifically to cutting tools mentions various technology that is still common today, such as shrink-fit toolholders and HSK interfaces that ensure stability through simul- taneous contact with spindle face and taper. "High-speed machining is a system, with its many components interlinked," wrote then Senior Editor Chris Koepfer, articulating a central theme of various high-speed machining articles MMS would publish in the ensuing years (Mr. Koepfer is now editor-in-chief of MMS sister publication Production Machining). Application Stories Are Appreciated A rising tide lifts all boats, as they say, and Mr. Koepfer used his monthly column to thank sources, particularly the end users covered in the application stories. 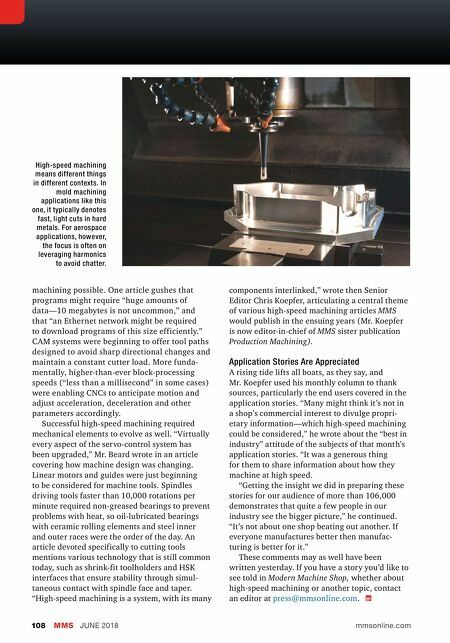 "Many might think it's not in a shop's commercial interest to divulge propri- etary information—which high-speed machining could be considered," he wrote about the "best in industry" attitude of the subjects of that month's application stories. "It was a generous thing for them to share information about how they machine at high speed. "Getting the insight we did in preparing these stories for our audience of more than 106,000 demonstrates that quite a few people in our industry see the bigger picture," he continued. "It's not about one shop beating out another. If everyone manufactures better then manufac- turing is better for it." These comments may as well have been written yesterday. 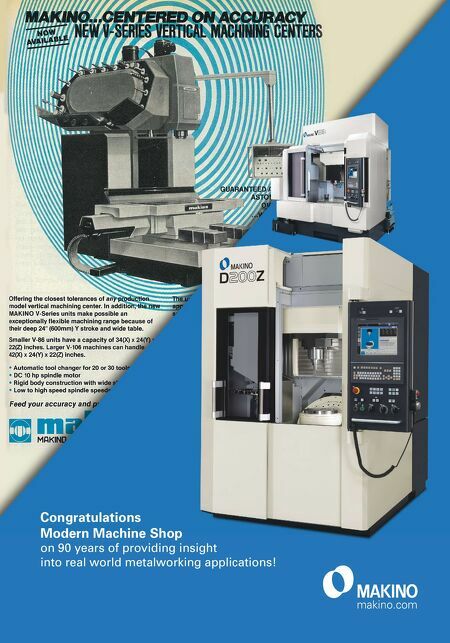 If you have a story you'd like to see told in Modern Machine Shop, whether about high-speed machining or another topic, contact an editor at press@mmsonline.com . High-speed machining means different things in different contexts. In mold machining applications like this one, it typically denotes fast, light cuts in hard metals. For aerospace applications, however, the focus is often on leveraging harmonics to avoid chatter.